You belong where all the excitement is! The Sheraton Park Hotel at the Anaheim Resort, ideally located within walking distance to the DISNEYLAND Resort, the Anaheim GardenWalk and the Anaheim Convention Center, is your perfect Southern California haven. Our service team winners of the prestigious Best in Class award from Starwood Hotels looks forward to the honor of welcoming you to our 11 acres of tropical ambience blended with executive elegance. An abundance of upscale amenities will make your experience complete.After a busy day, settle into one of our 490 guest rooms and suites, all featuring private balconies with views of either the lushly landscaped patio and pool area or the DISNEYLAND Resort and GardenWalk. Club Level accommodations provide additional comforts such as complimentary continental breakfast, complimentary evening hors doeuvres, as well as a business center and other exclusive amenities.Stay connected with Wireless High Speed Internet Access, available at complimentary computer workstations in the lobby, or in all guest rooms for a nominal fee. Our flexible meeting space is conveniently located on the ground floor, and also has 100 Mbps of bandwidth to meet your online needs. When its time to relax, take advantage of our multiple dining options and year-round pool bar.Theme parks, shopping, dining, entertainment and thats just within a block of our front door ! 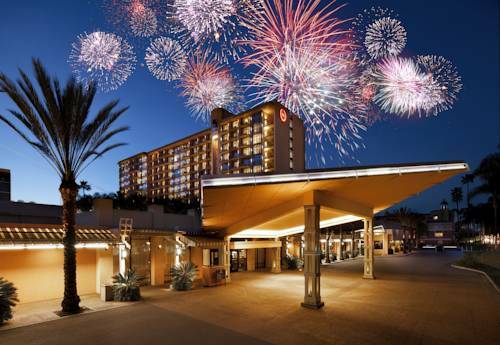 Youre never far from something to see or do at the Sheraton Park Hotel at the Anaheim Resort. Its all part of your very VIP experience with us, where youre not just a guest, but our family. Good Eats served daily for breakfast and lunch. Known for our wide variety of omelets, fresh turkey sandwiches, old-fashioned milk shakes and malts.